Hopyard Cycles01873 830219work Cycle HireHopyard Cycles is run from Hopyard Farm, Abergavenny by Bob and Diana Blowfield. Full range of cycles to hire to suit all the family - adult, junior, trailers and baby seats. 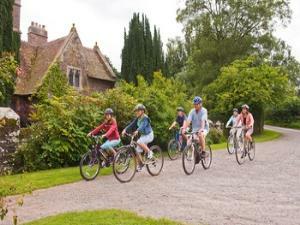 Cycle from the farm into Govilon village and connect with the Brecon and Monmouth canal towpath or use the Sustrans converted railway track up to Brynmawr. Quality front suspension disc brake mountain bikes in 4 sizes. Use the near by mountain trails on the Blorenge and Sugar Loaf mountains or try Cwm Carn nearby. We will deliver to hotels, guesthouses and bed and breakfast establishments. Small delivery charge (£5) within 3 mile radius of Hopyard and £1 for additional miles. Hopyard Cycles is run from Hopyard Farm, Abergavenny by Bob and Diana Blowfield. A security deposit is required on all bike hires.- amount dependant on cycle hired.